Durability and power are much in evidence in this Bent Press by record holder Elwood Holbrook. The ponderous dumbbell this 45-year veteran lifter is hoisting belongs to Paul Anderson. 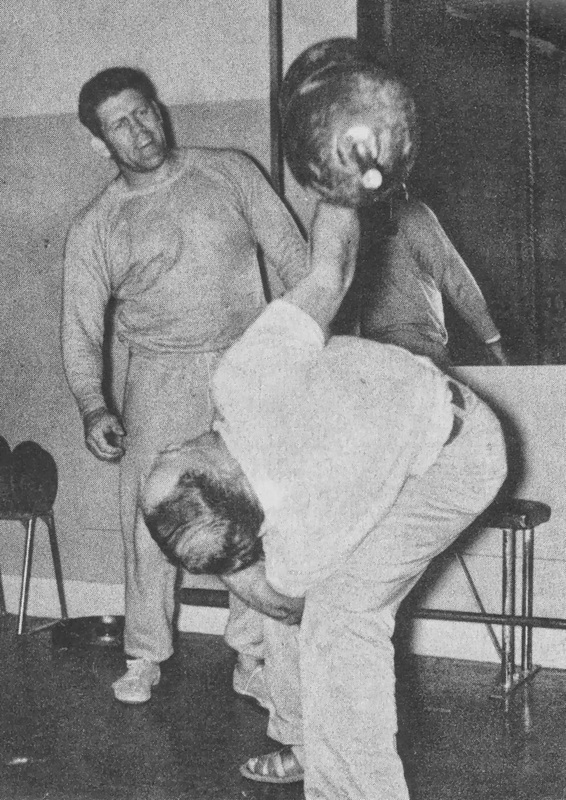 Elwood succeeded in completing the Bent Press with the dumbbell loaded to 230 pounds. This poundage exceeds his own bodyweight by more than 60 pounds. It's been two years now since Dave Keaggy, Bill Reynolds and I traveled to Moscow on a fact-finding mission. Since the early Fifties, the Soviets seem to have discovered strength training techniques better than those used in the West. I say 'seem to have discovered' because no one ever took the time to find out -- no one really knew for sure exactly what it was that was giving them such a huge margin in the strength sports. Was it their drugs? Was it that they conscripted armies of guinea pigs to try out for sports? Was it some mystical potion of magical technique that allowed Alexeev, Rigert and the scores of other strength athletes coming out of Russia to so dominate international competition? Was it some sort of Commie plot? Look around you at the coaches in this country; the successful ones and the not so successful, football coaches, strength coaches, track coaches and the self-coached athletes. From high school through the pros, do you see any continuity? Do you see any underlying rationale or scheme or approach? See any real effort to unify our collective knowledge and experience? See any truly meaningful research going on that will ultimately reach the hands of the rank-and-file coaching world? See any effort to provide the coaches of the young athletes with the benefit of scientific training and conditioning techniques that are more than just slogans (when the going gets tough the tough get going mentality). Does the hot air from old coaches who, in their heyday, were lucky enough to have been gifted themselves as athletes or lucky enough to have coached a few who were, ever really fan the flames of wisdom? I see none of that going on here, but I did in Russia. Armed with first generation computers, a sports-mad population and some brilliant thinking on the part of their sports scientists, the Soviets look for the edge. They actively seek training wisdom. They compile, analyze, experiment and manipulate. They find the methods that work best, and discard the ones that aren't as good. The ones that don't work they discarded back in the Fifties. Most of the ones the Russians use now or discarded long ago still exist in this country, but there is no real effort to unify or to disseminate such information. We plod along, making the same mistakes that our top lifters of 30 years ago made then. There is little progress here, and mainly status quo lifting in dwindling ranks of Olympic lifting competitors. They, and even their powerlifting brothers regard Soviets as masters of strength. Phooey! Maybe in Olympic lifting circles they are, but if I have anything to say about it, the day they enter powerlifting competition is the day that aura will fade. They'll get beat. You see, we're learning. The simple strength training system outlined in this article is an example of their training wisdom, true, but now we too have it, and we have much more. We have learned from the mistakes made by our Olympic lifting coaches and athletes. They've been left in the dust because they have not progressed in their training wisdom. They still do things the same way they did years ago. I see no cycling, no restorative techniques, no scientific approach to much of anything. I know because I've been there. Powerlifting in this country is dynamic and alive; we are learning all the time. 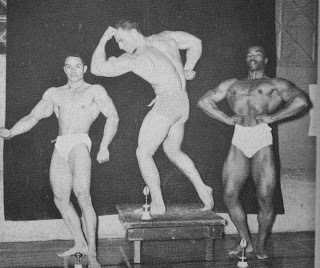 We have not rested on our laurels, and we are willing to take a lesson from the Soviets, something the Olympic lifters ought to do if they tender dreams of ever making it back into the winner's circle. Indeed, Powerlifting in this country is progressing at such a rate that if the Soviets ever want in, they'll have to take a lesson from us. Dave Keaggy took the training cycle of the Russians and adapted it to powerlifting. Over the two years he and I have been experimenting with it, training several highly trained lifters in the process, we've learned a few things about proper rest. We've learned how to cycle, how to build a restorative element into the regimen. How to train with our heads, not our egos. The system is called a six-week quick strength gain program by the Russians, but we've found that it can be used over several six-week cycles, with nothing more than a few days of active rest in between each cycle. I have successfully combined the program with plyometric type training to help establish some explosiveness for eliciting maximum recruitment instantaneously during the execution of heavy lifts. The plyometric training involves both upper and lower body techniques, and will be covered in a future article. The six-week training regimen calls for all three lifts to be done three times weekly, either on the same day (which is possible because of the built-in intensity control) or on alternate days (for some of us 'older' lifters). The traditional assistance exercises can, and probably should, be done after the three main exercises. I favor doing the high bar squats rather than the competition technique (for greater leg strength), and the stiff-legged deadlifts rather than the competition technique (for greater glute and ham development). I also favor compensatory acceleration in the squat and bench movements in order to derive maximum recruitment patterns and therefore greater functional strength stemming from the improved overload. There has not been a single lifter who hasn't marveled at their strength gains after following this program religiously. The critical element in whether it's successful for you is in your determination of your 100% lifts. Don't put 500 pounds down if you've never done that much before, and don't put it down if you did it last year, but are only capable of 450 now. It is critical that you use REALISTIC poundages to start out. They can be adjusted up or down after the first few days of the program, provided restraint is used in doing so! YOU MUST STICK TO THE PERCENTAGES! Top numbers indicate percentage of current maximum single lift. Last number by third fraction indicates number of sets at that poundage. Use ultra-strict form for each rep.
80/2/6 = 80% of max, 2 reps, 6 sets.